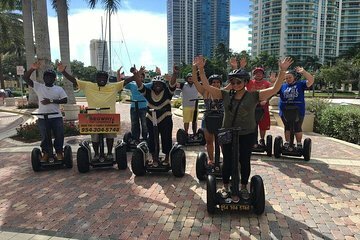 Comience su recorrido en Fort Lauderdale Riverwalk con una breve sesión de entrenamiento y póngase cómodo usando su Segway. Con el entrenamiento fuera del camino, es hora de salir a la carretera. Recorra un bucle desde el Riverwalk y el centro histórico del distrito. Visite los restaurantes, bares y tiendas, además de las atracciones como el Broward Center for Performing Arts, un gran complejo de teatro y entretenimiento con múltiples locales y el Museo del Descubrimiento y la Ciencia, uno de los museos más grandes de su tipo en Florida. Echa un vistazo a los rascacielos del centro y aprende un poco sobre la historia y el desarrollo de la ciudad. Finalmente, pase por Old Fort Lauderdale y el Museo de la Sociedad Histórica de Fort Lauderdale. Tome todo, desde el recorrido de 1 hora y continúe hasta el puente levadizo de 17th Street Causeway. Desde allí, admire la vista de Port Everglades, el segundo puerto de cruceros del mundo. Continúe con más visitas antes de un viaje de regreso al Riverwalk. Tenga en cuenta que: hay un máximo de ocho (8) pasajeros por guía turístico; la duración total del tour incluye una lección de 30 minutos para ayudarlo a familiarizarse con el Segway. Great way to see Fort Lauderdale. Tour guide was great with safety and training. Belle promenade pour découvrir la ville. We had a terrific tour. Alan our guide was great. Would do it again!! We took this tour on New Years Day in the afternoon and although it was ok it definitely was not the best time of day for such a tour. We found it interesting but since we came back the same way we went it was repetitive. Our guide was ok but we just felt the tour lacked information and substance. We have been on many Segway tours and this wasnt our favourite. This tour was amazing. Jeff and Justin our tour guides were very knowledgeable and using the Segway tour on our first day was a great way of getting to know the area. If you visit Fort Lauderdale this trip is a must do!! We had a blast with Matt, our guide. He taught my wife how to ride in under five minutes. It was a fun time and one I will certainly do again. We booked a two-hour tour Friday morning at 9 am, and had a a tour group of myself and my three teenage kids. Learning only took about two minutes per person and everyone became an expert after 15 minutes. It's easier than riding a bike or roller skates, and it was no trouble to take cell-phone pics while riding. Our guide, Christopher, was pretty friendly and knowledgeable. He was also very safety-conscious, so I never felt worried about my kids getting hurt. 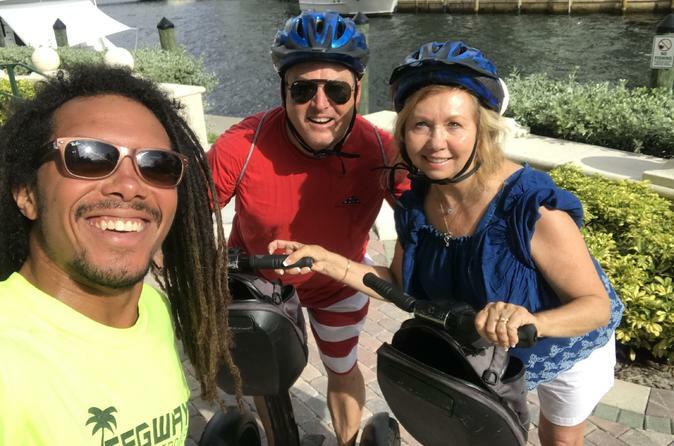 The sights are good, but the fun part is just being able to ride around on Segways. My wife and I were the only 2 on our tour. The guide was 1 hour late due to car trouble supposedly. We paid for a 2 hour tour and he took us on the one hour tour but it started raining at the end so it was for the best. Had he been on time we would have had plenty of time to take the 2 hour tour. The tour itself was really good. We got to see quite a bit of the downtown area crossing over the canal on the draw bridge. Contacted the one that booked my tour immediately after and he was very nice, apologized for not delivering on the 2 hour tour and refunded the difference in what we booked and the one hour tour. As I said the tour itself was really good and I hate that we did not get to experience the full 2 hours.